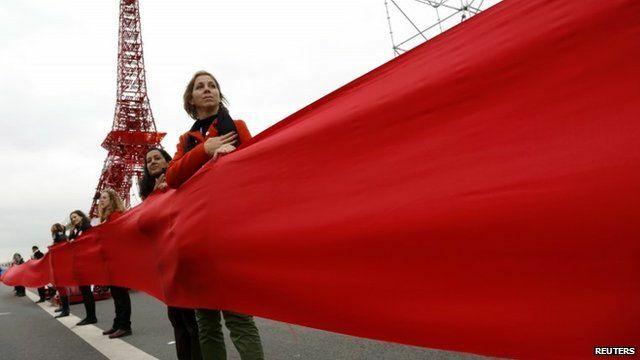 Protesters hold 'red line' climate demo Jump to media player Demonstrators in Paris wore red at a demonstration near the Arc de Triomphe, as the BBC's Iolo ap Dafydd reports. Demonstrators in Paris wore red at a demonstration near the Arc de Triomphe, to highlight the red lines they do not want negotiators to cross. France's Foreign Minister Laurent Fabius said the aim of the final draft was to limit warming to "well below 2C".